For more than 14 years . . . Interested in the current schedule of classes? Calendar of events and activities? Or, do you want to sign-up for a class? 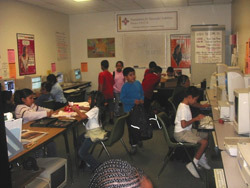 Through our mission and in providing technology access and training, we demonstrate that technology is a tool to be used for personal and professional growth, for academic achievement, creative expression, civic engagement, and much more — for bridging the 'divides' that prevent individuals and families from reaching their full potential. We also recognize that every person may not aspire to be high-tech gurus or corporate leaders. Thus, our goal is to train, teach, encourage, and guide — in a way that provides the knowledge and skills people need to make sound and wise decisions for themselves, their family, and community. Our accomplishments continue to encourage us and our ability to build relationships with a wide range of groups and organizations in Los Angeles and across the country is exciting and motivating. 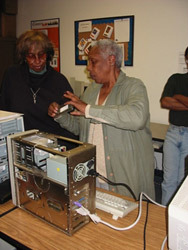 We remain actively involved in the promotion of community technology and advocates for policies that support making technology accessible to low-income and underserved communities. 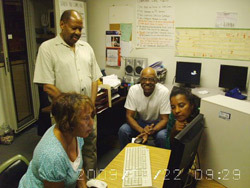 We are proud of our accomplishments and our ability to build relationships with a wide range of groups and organizations in Los Angeles -- remaining actively involved in the promotion of community technology and policies that support making technology accessible to low-income and underserved communities.